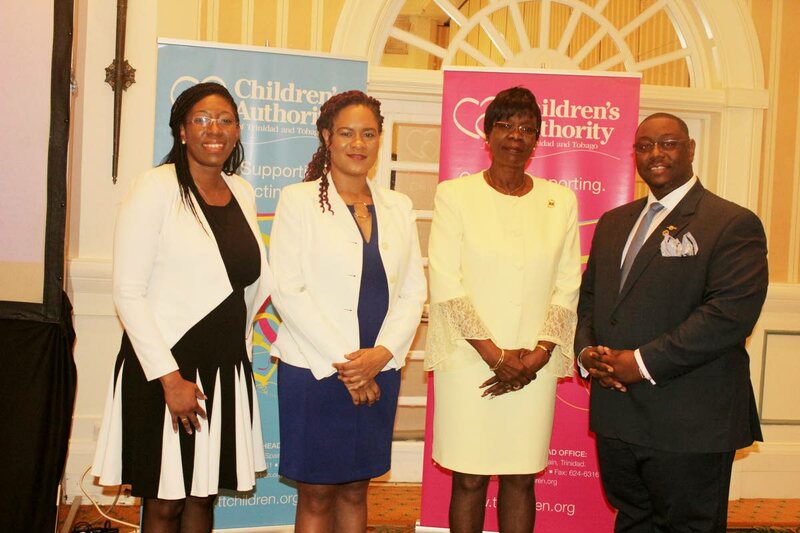 Ayanna Webster-Roy, second from left, MP for Tobago East, Minister of State in the Office of the Prime Minister stands Dr Agatha Carrington - Health Secretary, third from left, Hanif Benjamin, Chairman of the Children’s Authority and Safiya Noel, Director of Children’s Authority at a press conference for the commissioning a Children’s Authority Child Support Centre in Tobago on December 14 at the Magdalena Grand Beach and Golf Resort in Lowlands. There were 400 reported cases of children in need of care and protection for the period May 2015 to October 2018 in Tobago with mothers accounting for 26.3 per cent and fathers 15.5 per cent of the perpetrators. Sexual abuse, neglect and physical abuse respectively were the highest reported categories of child abuse and maltreatment for the period. This was revealed by MP for Tobago East and Minister of State in the Office of the Prime Minister Ayanna Webster-Roy at a press conference for the commissioning a Children’s Authority Child Support Centre in Tobago on December 14 at the Magdalena Grand Beach and Golf Resort in Lowlands. Webster-Roy spoke of her sadness and anger as she condemned the “dirty little secrets” that put the island’s children in grave danger. “My sadness stems from the fact that on my home island, the place where I raise my three children, there were 400 reported cases of children in need of care and protection during the period of May 2015 to October 2018,” she said. “My emotions of anger are primarily routed in the fact that in cases where the alleged perpetrators were identified, mothers accounted for 26.3 per cent and fathers accounted for 15.5 per cent. As a matter of fact, the statistics show that where the alleged perpetrators were identified, it was a person known to the child. “More troubling to me is the fact that sexual abuse, neglect and physical abuse respectively were the highest reported categories of child abuse and maltreatment in my beloved island of Tobago. “As Tobagonians, we often boast about how friendly we are. We boast about how we value our family ties, we boast about how clean, green, safe and serene our island is but clearly some among us are beast behind closed doors. “Our island is plagued with dirty little secrets and our children, our most valuable resource, are in grave danger. Webster-Roy said sustainability of a future for Tobago lay in the proper upbringing, protection and development of children as she alluded to the island’s quest for internal self-government. “The autonomy that we crave as Tobagonians and the success of the internal self-government is highly dependent on our island being able to safeguard the safety and well-being of today’s children. If we want to ensure that Tobago reaches its fullest potential and we really live up to our promise behind Tobago Beyond Ordinary, we must care and protect our greatest resource, our children,” she said. Webster-Roy pledged the Government’s commitment to the protection of the children from abuse and support for the Children’s Authority. 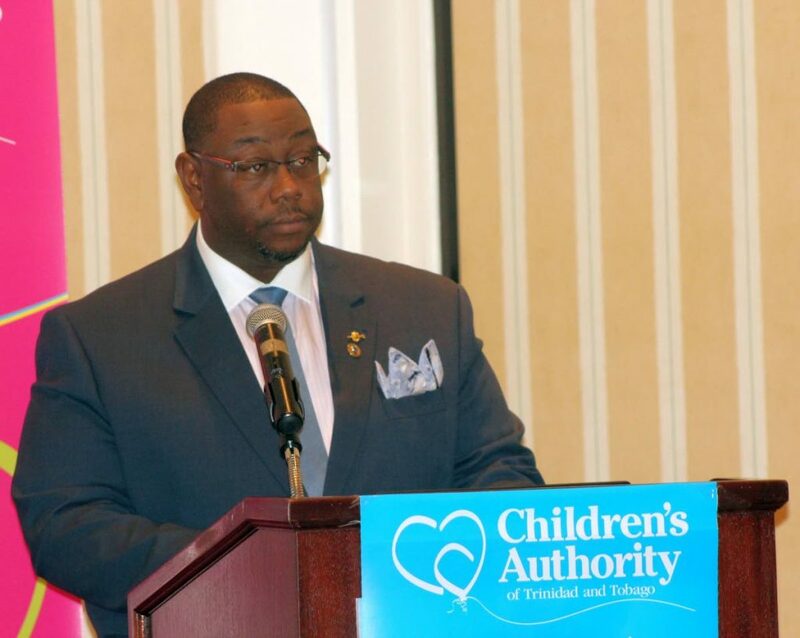 Hanif Benjamin, Chairman of the Children’s Authority, delivers remarks at a press conference for the commissioning a Children’s Authority Child Support Centre in Tobago on December 14 at the Magdalena Grand Beach and Golf Resort in Lowlands. Also speaking at the press conference, Chairman of the Children’s Authority, Hanif Benjamin, said the Authority has heeded the calls for help from Tobagonians. He said the setting up of the centre in Tobago does not negate the work of carers of children, especially in reporting on cases of abuse. “We have heard your calls and we have listened. “Our presence does not negate your role as parents, guardian, teachers, caregivers and neighbours. We need you to report any suspicion you may have about child welfare to our hotline… we need you to report so we can intervene and provide the necessary support to the child and family,” Benjamin said. “I urge you to work with us… it is important for us to get into our communities, get into the homes, the schools, the churches to get the reports because a child who is hurt… when a child is hurt and continues to be hurt for years without intervention, that one scars me deeply. “I really urge us to get into the districts with under-reporting so that we can get those children the help that they need,” he said. Dr Agatha Carrington, Secretary for Health, Wellness and Family Development said the Division’s journey with the Authority was “reaping benefits” as the noted the licensing of a Probation Hotel and the establishment of the first-ever Community Residence for Children in Tobago. Reply to "‘Dirty little secrets’"